Being a scuba instructor, I take an interest in stuff like this. If you dive, or want to learn, Japan has some pretty cool options for you, more often than not with English-language assistance. And it's not just limited to the white-sand paradise of Okinawa. You can don your drysuit and head to Hokkaido, or just a 5-7mm and hit the Eastern coast of Honshu. 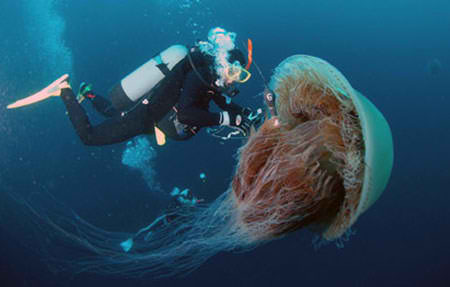 In fact there are around 2,000 individual dives sites around Japan. Sure, it's predictable. For a reason. Year-round sea temperatures of between 20 and 30C (70-86F) mean you may not even need a wetsuit. 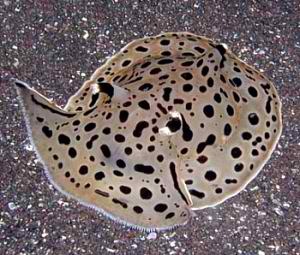 Life, most abundant off the ryukyu islands, includes a large portion of the most popular suspects - hammerhead sharks, turtles, mantas, jacks, trevallys, jellyfish, nudibranch and suchlike. 400 different coral species can be observed on the world-class reefs. Also of special interest are the large number of WW2 wrecks, as well as cave systems and caverns. 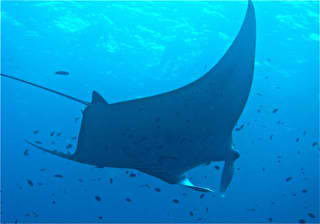 Islands of special interest would be Ishigaki (mantas) and Kerama (corals). Let's not forget one of Japan's most interesting underwater sights - Yonaguni "ruins". The quote marks are appropriate because no-one has conclusively proved that the structures are man-made. If they aren't, they're quite the natural phenomena. 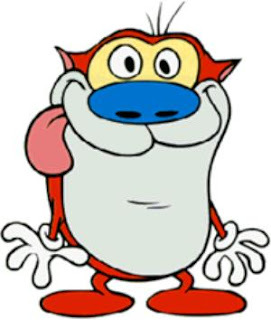 More info is found on Wikipedia. It's best to book ahead on this one, as trips are not that frequent (some shops only go a few times a year). Be prepared to see massive numbers of hammerheads in the winter. Prices start around 12,000 for 2 boat dives. Accessed via Tokyo port (30-hour ferry), and is technically a part of Tokyo. But you would certainly never know it. More than half of these islands are designated national park land. Lots to see here. It's the biggest breeding ground in the world for green turtles. There's (sperm) whale-watching, dolphins, again that beautiful coral typical of the pacific islands, a serious amount of colourful reef fish (including the rare wrought-iron butterfly fish) as well as some bigger life - dogtooth tuna, nurse sharks, sand tiger and bullhead sharks. Also, some wrecks. And, if you want to betray your hobby, fishing for big trevally, amberjacks, spotted knifejaw, jobfish and more is possible. Ogasawara Diving Centre is pretty much your only choice. 2 hours by train from Tokyo, located on the mountainous Central/South-East coast of Honshu. Diving is possible year-round, though be prepared for water colder than England (10C/50F) in the winter (and accompanying 40m+ visibility). August-October offers temps around 27C/80F. Enormous moray and conger eels, elaborate seahorses, amazing examples of pinecone fish, and a lot of others; which may seem familiar from micronesia or melanesia but have subtle, interesting variations. Dive shops in Tokyo can arrange trips. There are also several shops in Izu at the many locations all around the coast. 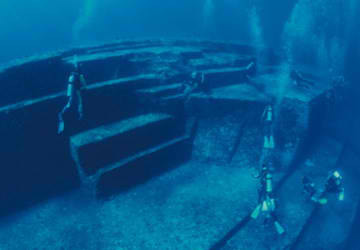 Cheap shore dives are possible from Osezaki, where ancient volcanic ash lies in abundance underwater and a view of Mt. Fuji in good weather sits over it. The southern tip of the peninsula offers more of a challenge, and rewards with schooling hammerheads in summer months. 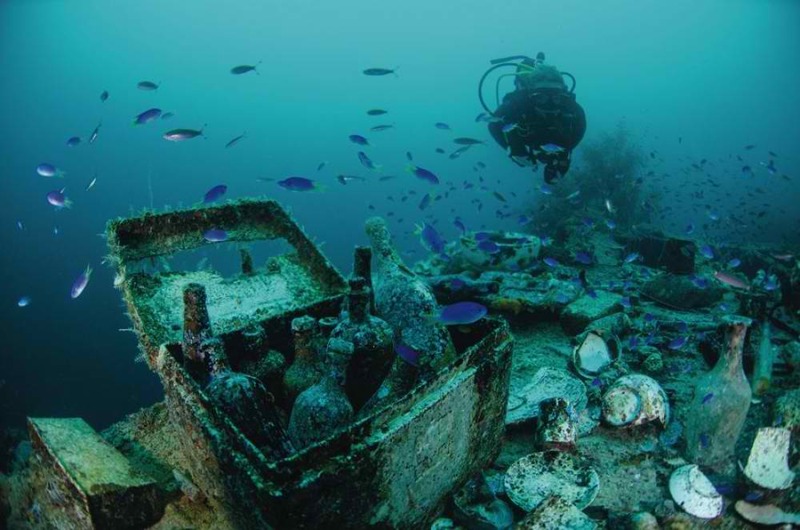 Futo, on the Eastern coast, also has shore diving and an impressive wreck. Prices start at around 2000yen plus gas and equipment, but expect to pay about 3-4,000 average per dive. The 7 major islands which lie to the east and south-east of the Izu Peninsula are called Izu Shichito. All the islands have dive possibilities, though English is limited. Your best bet is to book with an English-speaking agent on the peninsula- or a Tokyo-based shop. Access via air or long ferry rides. Sea-life includes high-grade coral formations, dolphins, and many of the shark and turtle/fish/eel combinations seen on the peninsula, along with a selection of nudibranchs like nowhere else. One word of warning, however. These islands are prone to volcanic activity. In fact, Miyake-jima had to be evacuated for five years due to volcanic gas emissions in 2000. Residents still carry emergency gasmasks. Shops on these islands include Hisaichi Divers Club (Japanese only), in Hachijo, which also offers accommodation. Prices are steep, though. Shore dives start at 7,500yen. Boat dives from 11k. SeaDive (Japanese only) starts at 6,600 very nearby. In Oshima, Pension101 offers 4 beach dives for 24,000yen. Miyake offers Birdy, which has a terrible website but can be contacted (Japanese only) on 04994-2-0776. Remote rock Sofu-Iwa also has a well-established dive operation. Prices start at 8,500. Other islands have shops reluctant to join the internet revolution, or which simply rely on agents in Izu and Tokyo for custom. 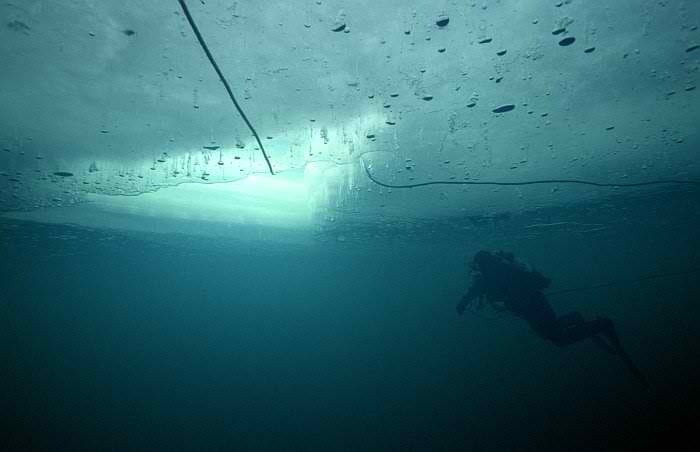 Though summer months are best spent on land in Hokkaido, winter brings with it the hard-core diver's dream: ice diving. Get your drysuit on and jump into sub-zero waters for drift or penetration diving! Especially interesting is February-March, where the ice floes from the Sea of Okhotsk reach Hokkaido. Floe diving and trekking is possible if booked far in advance. Diving gives the opportunity to see the rare and enchanting clione, or Sea Angel (a type of sea slug). As well as mantas, flounder and unique urchins. A comprehensive list of shops with contact information can be found here. You could do worse than start with Dolphin Hotel (based in the Shiritoko area). You can expect dives to cost about 12,000yen each. Learning to dive is possible in English in Japan. However, costs are between 60,000 and 100,000yen. If you have the chance, go to Thailand or the Philippines to get a cheap Open Water course (around 30-40,000). Japanese people, like many Asians, are very keen on touching stuff underwater. Especially sea cucumbers and turtles. This seems to be a cultural thing and wins them no favours elsewhere in the world. Don't follow suit! After 4 years in central and eastern Japan, Dom now lives in the Philippines, where he continues to write for AccessJ. He is a co-founder of this website, and its webmaster. Why are the Japanese Such Bad Drivers?